As an international community, as we continue our efforts to raise awareness, we assertively continue to support the film, The Boy Who Smells Like Fish, as it competes in the Miami International Film Festival (MIFF) on March 2nd. I know we can easily place our film as the most visited. Please be a part of this. the most visited film (online) is “After Lucia,” and the second-most visited is “The Boy Who Smells Like Fish, with EENIE MEENIE MINEY MOE trailing closely behind.” Let's make The Boy the NUMBER 1! The way to vote for our film to simply visit the page, and that counts as a visit. Ideally, if you would then add it to your calendar, click on “Like,” and tweet it if you can, that would be even better. You can share it with friends (other sufferers?) on facebook, or email your family and friends. By doing all this, we may very well be helping this film in the competition, and most importantly, we will call attention to the plight of all sufferers. 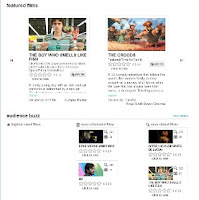 If you would like to see the ranking of the film, and how it is in relation to the other top films, you can visit, http://miami.festivalgenius.com/2013/films/theboywhosmellslikefish_analeinecalymayor_miami2013, and click on “Olympia Theater at the Gusman Center for the Performing Arts” venue.